This is a little poem taken from the Straussburgh Chronicle of Kleinkawel, written in 1625. It describes something known as "Dancing Mania". 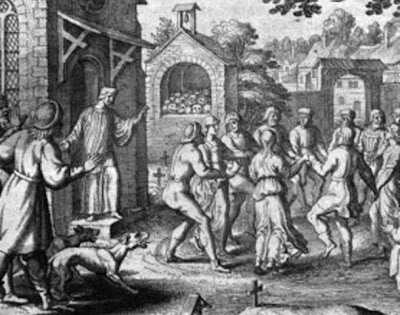 The earliest known mentioning of this "disease" comes from the 7th century, but one of the biggest outbreaks of dancing mania happened in Aix-la-Chapelle, in July 1374. A group of people was then seen dancing uncontrollably in the streets, foaming at the mouth, and screaming of wild visions. Pieter Brueghel the Elder (1564). Source. This mania could consist of up to thousands of people who gathered and danced until they collapsed from exhaustion. From the 14th century this phenomenon spread throughout Europe, until - for some reason - it died out by the middle of the 17th century. Scientists have described dancing mania as a "collective mental disorder", "collective hysterical disorder", and "mass madness", but still we don't have a sure answer to what caused this behavior. Initially it was considered a curse sent by St. John the Baptist, or St. Vitus, and is was therefore known as "St. Vitus' Dance" or "St. John's Dance". Painting by Pieter Brueghel the Younger. Source. It is debated whether this dancing were spontaneous or organized events. But what is certain is that the dancers seemed to be in a state of unconsciousness, and unable to control themselves. While dancing around crazily they screamed, laughed, cried, or sang, and they ended up getting chest pains, convulsions, hallucinations, hyperventilation, epileptic fits, and visions. 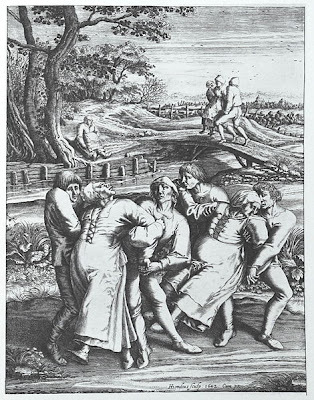 Some danced until they broke their ribs, and subsequently died, but most of the time the participants just dropped to the ground with exhaustion. 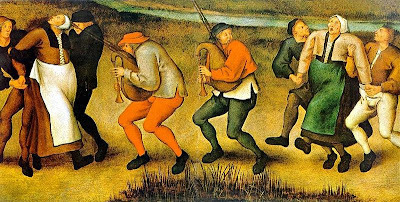 Scientists have tried to explain dancing mania as a result of different diseases, ergot poisoning, religious acts, and as the relief of "shared stress" from all the hardships people went through during those times - like plagues and floods. Sources agree though, that dancing mania was one of the earliest recorded forms of mass hysteria. This is so interesting to read about Miss Meadows, wonder what could have possibly caused this craze, it's insane that they weren't even really in a state of consciousness during the dancing.